American Morse Code was first used on the Baltimore-Washington telegraph line, a telegraph line constructed between Baltimore, Maryland, and the old Supreme Court chamber in the Capitol building in Washington, D.C. The first public message "What hath God wrought" was sent on May 24, 1844, by Morse in Washington to Alfred Vail at the Baltimore and Ohio Railroad (B&O) "outer depot" (now the B&O Railroad Museum) in Baltimore. The message is a Bible verse from Numbers 23:23, chosen for Morse by Annie Ellsworth, daughter of the Governor of Connecticut. The original paper tape received by Vail in Baltimore is on display in the Library of Congress in Washington, D.C. The first public telegram in America, "What hath God wrought" sent by Samuel Morse in 1844. 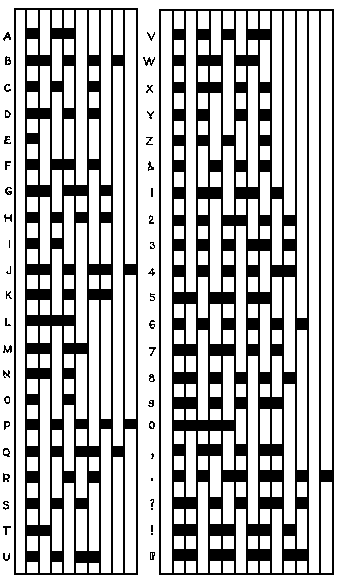 Various other companies and countries soon developed their own variations of the original Morse Code. Of special importance was one standard, originally created in Germany in 1848, which was simpler—it eliminated the long intra-character spaces and the two long dashes—but also included changes in the sequences for eleven of the letters and most of the numerals. The modified version was adopted as the European standard in 1865, and was known at first as "Continental Morse," although as its use spread it also became known as "International Morse." At this point the original Morse Code started to be called American Morse, to differentiate between the two main standards. In the late 1890s, radio communication—initially known as "wireless telegraphy"—was invented, and used Morse Code transmissions. Most radio operators used the version of the Code that they were most familiar with—the American Morse Code in the United States, and Continental Morse in Europe. However, because of the long range of radio signals, a single international standard was needed, especially for seagoing vessels. At the Radiotelegraphic Convention meeting in London in 1912, the section of the Convention covering "Transmission of Radiograms" included the statement that "The signals to be employed are those of Morse International Code." Even after this, the original Morse Code continued to be used throughout much of the United States. American Morse remained the standard for U.S. landline telegraph companies, including the dominant company, Western Union, in part because the original code, with fewer dashes, could be sent about 5% faster than International Morse. American Morse also was commonly used for domestic radio transmissions on the Great Lakes, and along the Atlantic and Pacific coasts. However, International Morse predominated for ocean-going vessels, and many U.S. shipboard operators became skilled in transmitting both versions of the Code as needed. Over time, with the disappearance of landline telegraphy, and the end of commercial radio use of Morse Code, American Morse has become nearly extinct in some states. In the United States, the ranks of amateur radio operators used to include many active and retired commercial landline telegraph operators, who preferred to use American Morse for their amateur radio transmissions, so the CW (continuous wave) amateur bands used to have a mixture of American and International Morse. However, today even U.S. amateurs use International Morse almost exclusively. Note: All links with the loudspeaker icon ( ) are sound files for the international version of each symbol. See media help for assistance. ↑ The "@" symbol was added in 2004, and combines A and C into one character.